Betflurry is a new online soccer betting game that allows you to bet on soccer matches each week without having to worry about how it affects your wallet. Purely for fun, it is certainly that! Betflurry is a completely free game that does not require you to spend any real cash or worry about losing any money either. It is absolutely fun for any fan of the Premier League, whether you like to bet or not. In fact, I would say that it is more fun for fans of the EPL who prefer not to wager their money on matches. So, what exactly makes it so fun? 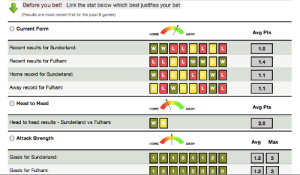 What I like about it is that you can take the information and statistics available to all fans and place a bet, without having to worry about telling your family that you just lost your savings when Hull City inevitably scores a stunning winner over Manchester United in what you thought was a sure bet. our Twitter account. When you first sign up you are taken through a quick tutorial, which includes a question about a match from last year’s competition of your choice. You are then taken to your home page and give a quick tour. The home page is very well laid out with your current betting slip displayed at the top, your current profile to the left and tabs for Matches, Statistics, Account and Leagues on the right. There are also links for current blog posts detailing some of the week’s top picks as well as other articles of interested. Once you are on your home page you can select which league you are interested in betting on by selecting from the Matches drop menu. Leagues include the Barclays Premier League, German Bundesliga, UEFA Champions League, Spanish Primera Division, Italian Serie A, and current World Cup matches being played. 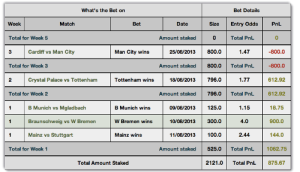 I would recommend that players spread out their bets across all of the leagues. There will always be matches that are more of a sure bet if you are looking for a high win percentage. If you feel like living dangerously, take a look at some of the odds on close mid table matches each week. Each week’s matches include the date of the match being played, the current live odds and the % chance of winning your bet based on which choice you make (home win, draw, or away win). For most matches there are also corresponding stats for each club playing including current form, head to head match-ups and attack strength. Keep up to date on everything going on at Betflurry and be sure to look out for upcoming contests and possible prizes for winners. One of the other fun features is being able to set up leagues to compete in with your friends. See who is able to make the most money and get the most games picked correctly. This can lead to some great banter between friends. You can even take your bets to Facebook and Twitter and let all your friends know what your doing. I would highly recommend that you head over to Betflurry and give it a try. It is loads of fun and completely free! What I really like about this game is that I am not a gambling man at all. I don’t like to make risks and don’t like to place bets. This game allows me to have the fun of placing bets and vicariously gambling without having to worry about the risks of losing money (and having to tell my wife about it). If you have played the game and like it or have suggestions or comments, please leave them below. You can follow Betflurry on Facebook or Twitter. Hi Todd, Sounds interesting. I know quite a few sites that tried something similar but I never had the interest to revisit these sites a second time. 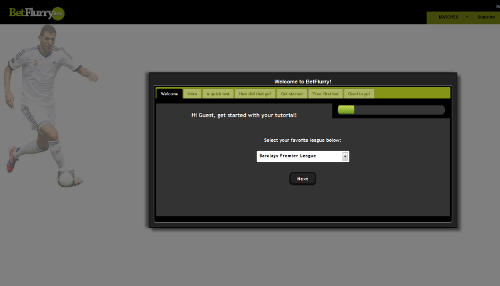 I had a quick tour of betflurry and feel the leagues and weekly format could make the difference. Plus it has a nice social feel overall. Would be better if they had bets other than match results too.